JHP Fasteners stocks an array of miscellaneous fasteners for a variety of applications. These products are manufactured from durable, high quality materials for appropriate lifecycles of dependable performance. Our inventory grows regularly, so if you don’t see the fastener products you need or are unsure what sort of specialty fastener is right for your application, please contact us—we’re here to help! 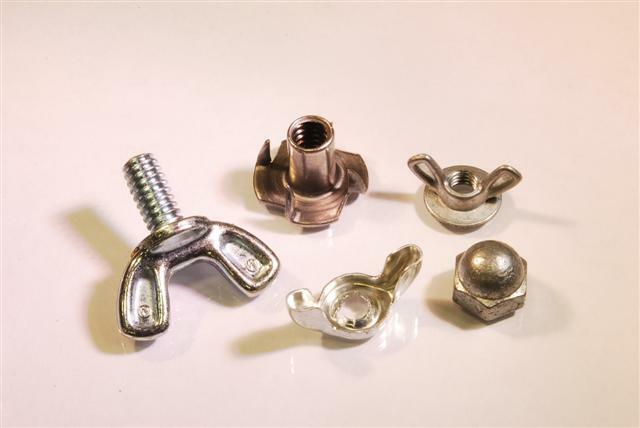 Sometimes spelled “tee nuts”, these fasteners are designed to fasten wood, particle, or composite materials and provide a flush surface upon installation. We offer t-nuts in a large range of standard diameters and barrel lengths. They are manufactured from stainless steel and mild (carbon) steel material and available in either plain or zinc plated variations. Designed to be easily tightened and loosened by hand, wing nuts are popular for a wide range of applications. JHP Fasteners has ready access to wing nuts in many thread sizes in both, mild steel, stainless steel and stamped or cold-forged varieties. The mild steel versions can be purchased in zinc-plated or black oxide finishes. Like wing nuts, wing screws are designed to be tightened and loosened by hand, making them ideal for any application where fast and easy installation may be beneficial. We supply wing nuts in numerous standard diameters and lengths. All of our wing nuts are of the cold-forged or stamped variety and manufactured from mild steel then plated with a clear zinc finish. Also called crown hex nuts or blind nuts, acorn cap nuts cover the threads at the end of a bolt to protect against accidental contact that can cause damage to people or finished surfaces. JHP Fasteners offers acorn cap nuts in a range of standard diameters. These nuts are manufactured from mild or stainless steel with nickel plating available on the mild steel iteration. Please see individual product listings for additional information, or contact us to learn more. JHP Fasteners invites our customers to take advantage of 45 years of industry experience and expertise. Based on your input, we will be able to provide you with expert guidance in selecting the right special application or general fastener for your unique project. Exceptional customer service, an extensive product offering, and competitive prices are just a few of the benefits of doing business with us. Contact JHP Fasteners today for more information on our specialty fasteners.